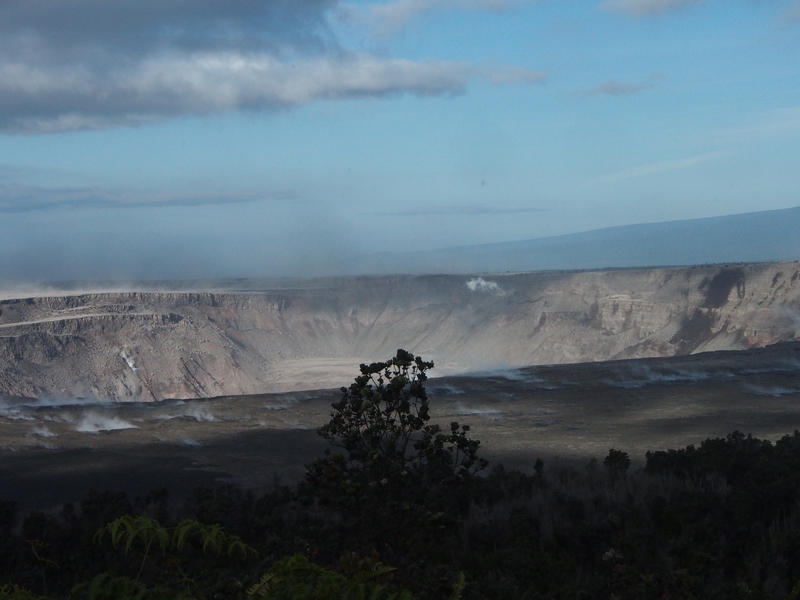 After a busy few months, Kilauea continues to rest with only a pilot light on, so to speak. This week’s big news was that Hurricane Lane passed offshore of the Big Island on Thursday through Saturday, causing extensive flash flooding. But there’s still a little news to report on the dying (?) 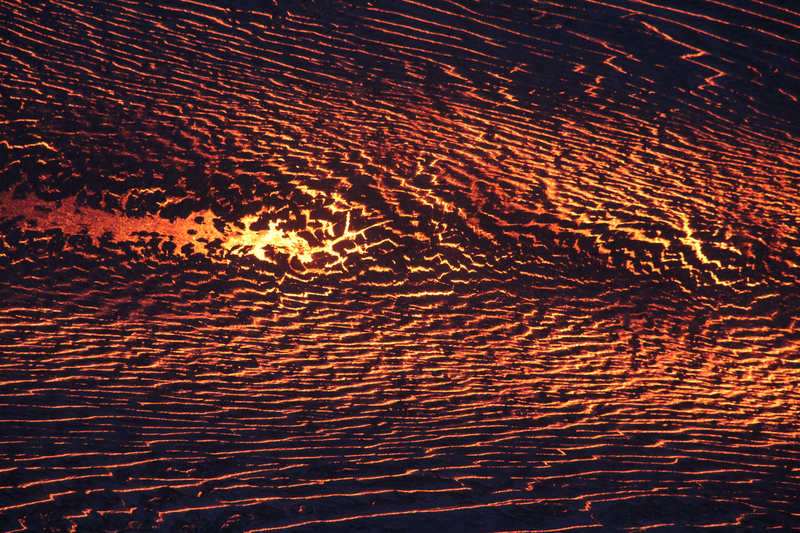 embers of Kilauea’s 2018 eruption. August 20, 2018. 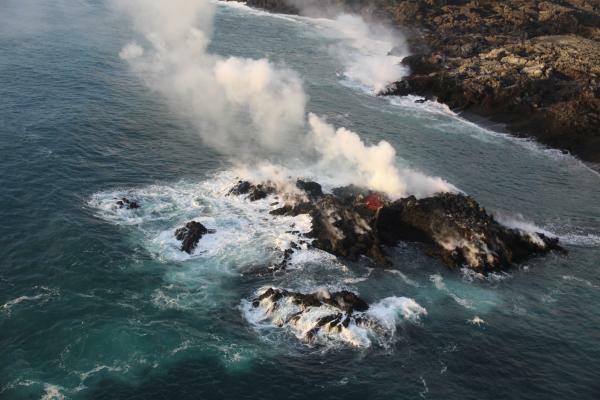 USGS photo of residual lava entering ocean, posted on their facebook page here. Sulfur dioxide emissions continue to be very low both at the summit and the coast. In fact, on Tuesday, they dropped too low in the Lower East Rift Zone for instruments to measure, although not too low for highly-sensitive human noses to detect. Video from August 17 posted on the 20th— full-sized version here. Heavy rain from Hurricane Lane on Friday and Saturday put a hold on USGS overflights and field observations and knocked out a few sensors on the east side of the island. But Kilauea’s extensive sensor network means there was no gap in volcano monitoring, and field crews were on call just in case. 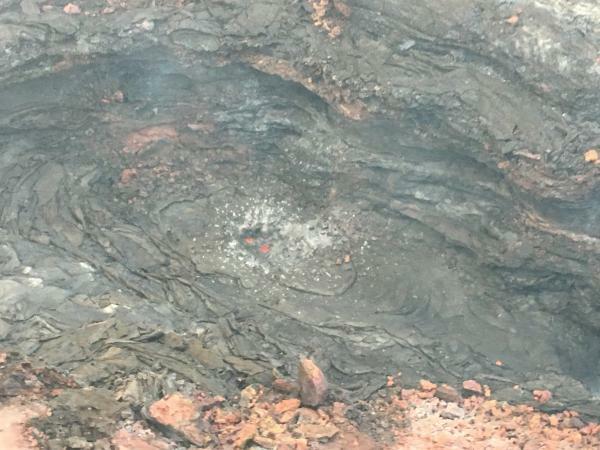 The hurricane had no impact on the volcano apart from heavy rainfall hitting hot rocks and turning to steam in Pu’u O’o’s crater and on the not-yet-cooled lava flows of the LERZ. There were some reports of local white-out conditions from this steam. Rain may also have triggered a few rockfalls at the summit. The other big Kilauea news this week is that Hawaii Volcanoes National Park has set a target reopening date for September 22, aiming to reopen at least the Visitor Center and (they hope) some kind of viewing area from which visitors will be able to see the new, larger Halema’uma’u Crater. 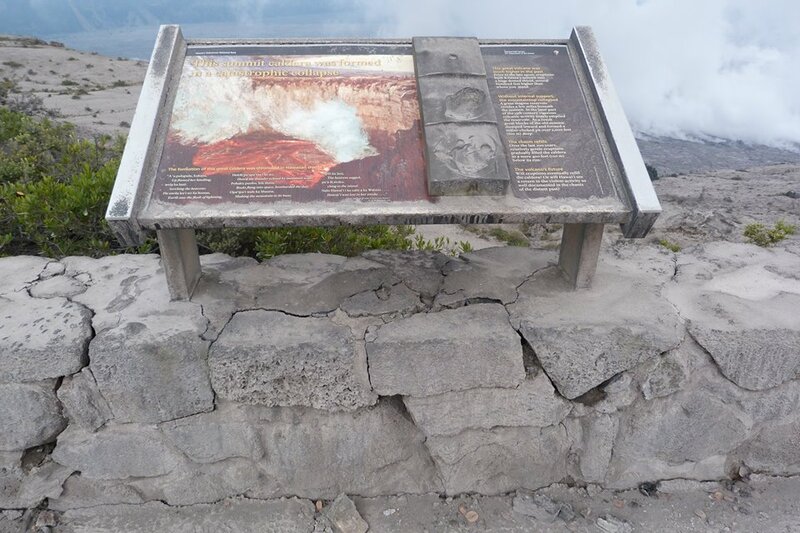 They’re also hoping to open Volcano House, but they need to check the stability of the cliffs on which it stands. Whoops! I think I missed last week’s edition. This is Hawaiian Volcano Observatory’s weekly column with photos and in-depth information on some aspect of Kilauea. 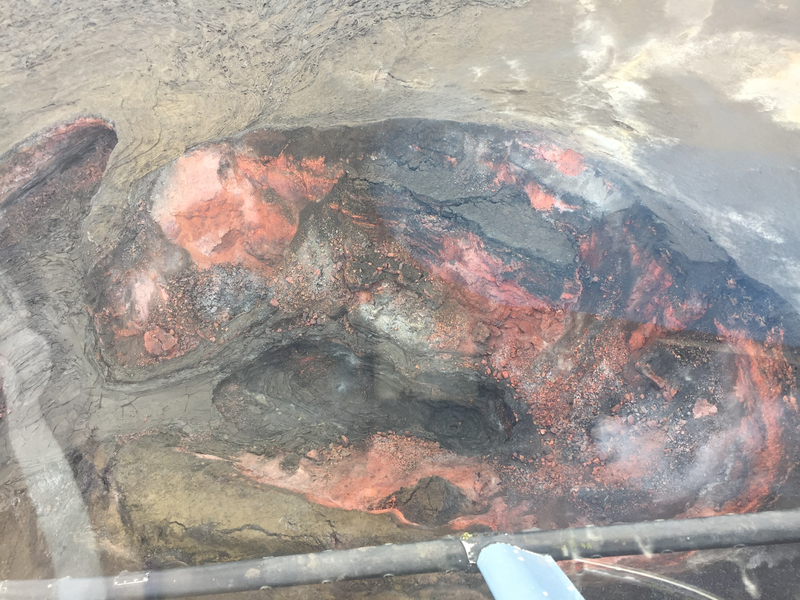 August 16: “Submarine Kilauea also impacted by recent events at the volcano” with a report on earthquake sensors deployed on seabed in July. August 23: “Voggy skies from days gone by: Reviewing Kilauea Volcano’s gas release” Lots of numbers, but they’re of critical importance to those who have to breath the stuff. 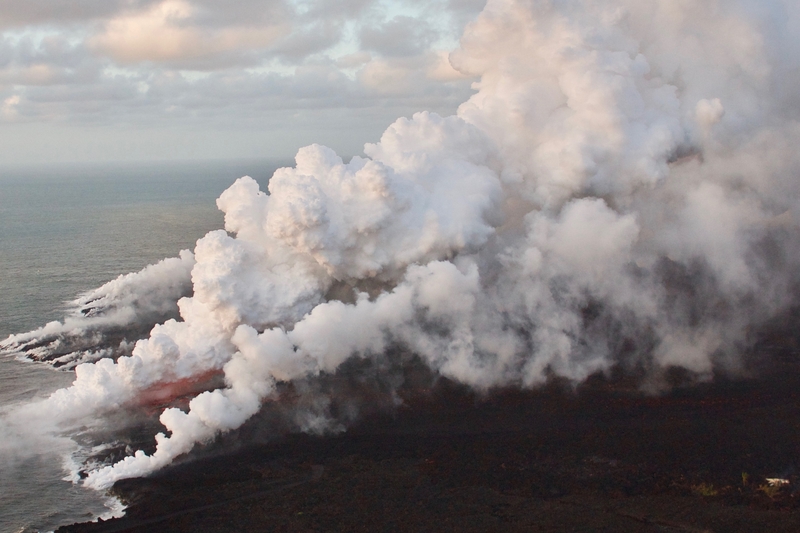 This article is a overview of the rise and fall of SO2 levels (vog) from the beginning of the Pu’u O’o eruption in 1983 up to the present lull in eruptive activity. Volcanic activity has decreased over the past few days, at both the summit and down in the Lower East Rift Zone. However, as HVO warns us (and has stated many times), eruptions wax and wane, and can even stop and start up again. So we don’t yet know whether Pele’s winding down or simply taking a breather. 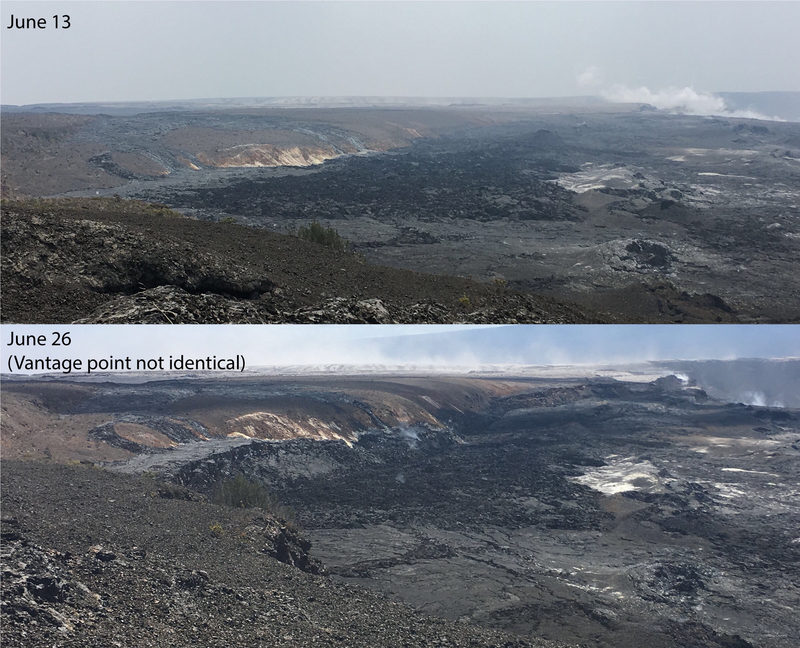 But for the moment, at least, Fissure 8 is putting out much less lava than before— in fact, this morning (August 5) its level is so far down that it’s barely feeding the channel. Lava levels were already lower and sluggish, and today the river is mostly crusted over and/or moving as thicker, crumbly a’a flows. However, blockages downstream are still causing overflows and breakouts. Rates of seismicity and deformation at summit and lava output from fissure 8 have decreased since most recent collapse event at 11:55 am HST August 2. Too soon to tell if the decrease will persist. Hazardous conditions remain. 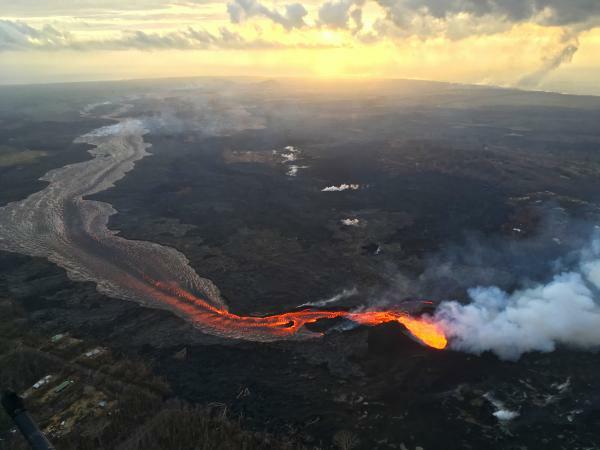 How long will #Kilauea #Volcano's lower East Rift Zone eruption continue? And we’re back to routine, except that Fissure 8’s providing a minor puzzle to keep HVO busy. Yesterday it didn’t exhibit the surge behavior that’s been typical after summit collapses for the week or so. 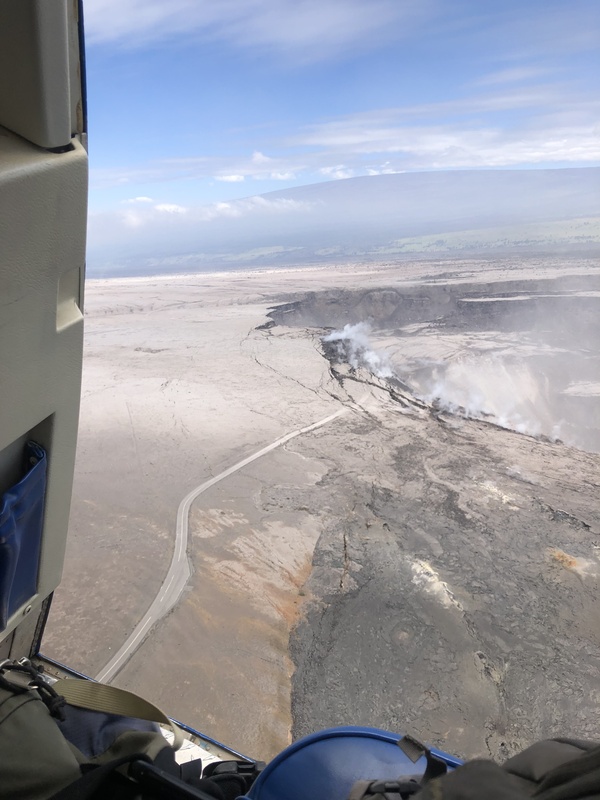 Today, nowhere near the time of a collapse event, “surging was noted at the Fissure 8 cone during the [morning] overflight but had stopped by the time ground crews arrived to verify it.” Otherwise, the channel’s lava level was low this morning. No other were fissures active. Both the strong southern ocean entry and weak “ooze-outs” north along the edge of the lava delta continue. Onshore, the southern margin of the flow front was reported to be half a mile from the Pohoiki boat ramp this morning. Unfortunately, that flow edge has stalled but not stopped, and a DLNR official warned Isaac Hale Park is still within its sights. We’re still awaiting the next summit collapse, which looks like it’s going to thwart HVO’s new “Northeast Caldera Rim” livestream by happening at night. Also out today is this impressive new Kīlauea Digital Elevation Model. 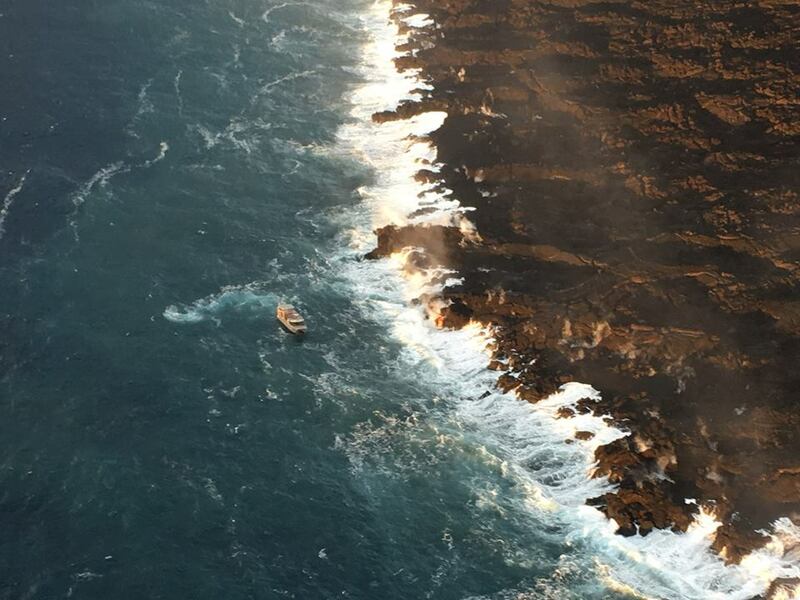 The big news today was a lava tour boat getting pelted by lava chunks from an ocean entry explosion, resulting in burns, bruises, and one broken leg. 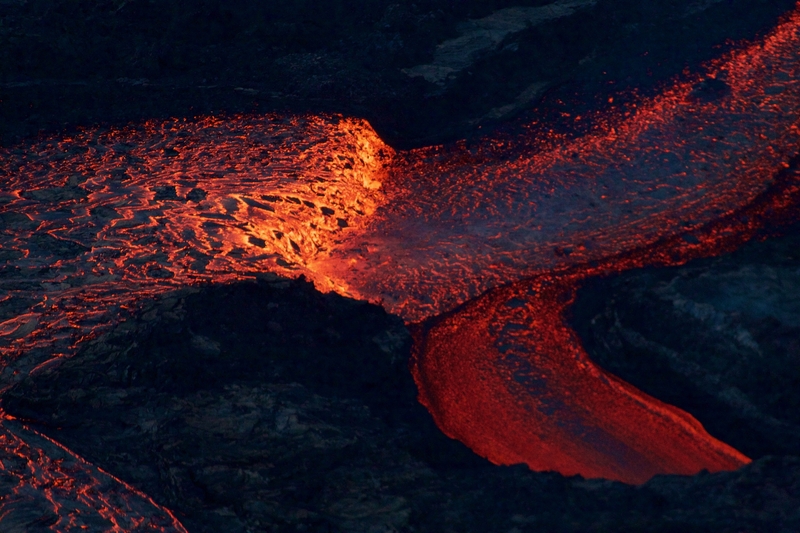 Next to that, the science of this eruption seems a bit trivial. 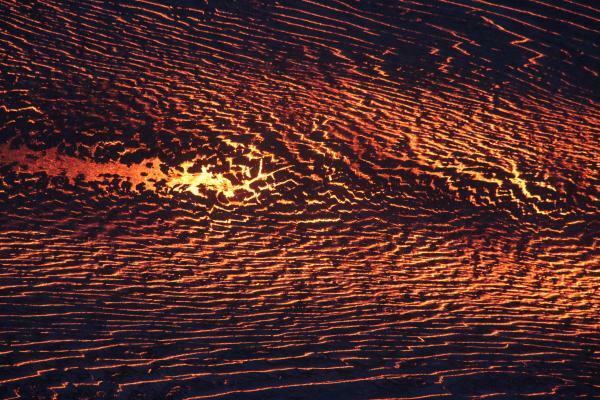 But this blog is primarily oriented towards the latter, so let’s get volcanology news out of the way first. This morning, over 24 hours after the previous summit collapse, the lava channel below Fissure 8 was full but not overflowing. Even after today’s 11:42am summit collapse, there was no observed surge— “Nothing notable in the way of overflows.” Last night’s field crews heard Fissure 22 grumbling to itself, but saw no visible signs of renewed activity. 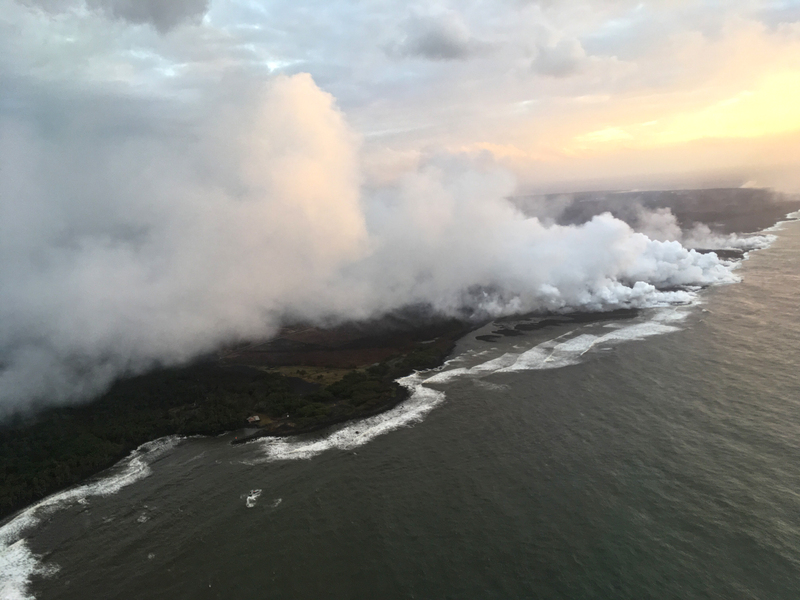 According to Civil Defense this afternoon, the southern edge of the main lava flow has stalled 1 km from Isaac Hale Park / Pohoiki boat ramp. Just north of there, the new ocean entry at Ahalanui is vigorous and dangerous. 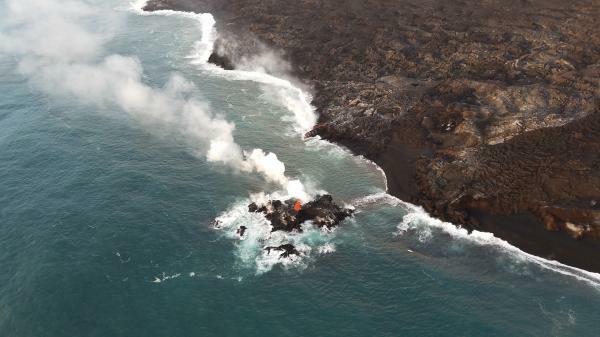 That’s where @hotseathawaii filmed an offshore explosion four days ago. There were more explosions this morning, “with at least one being quite strong” (USGS). USGS map of LERZ lava flows as of July 15, 2018, 1 pm HST. Yes, the tiny no-longer-an-island is visible in the full-sized image. Fissure 8’s lava flow has settled into its new course, turning right just before Kapoho Cone and proceeding south-southeast to the ocean in a strong channelized a’a flow. Some lava, apparently following the earlier paths (lava tubes, maybe?) 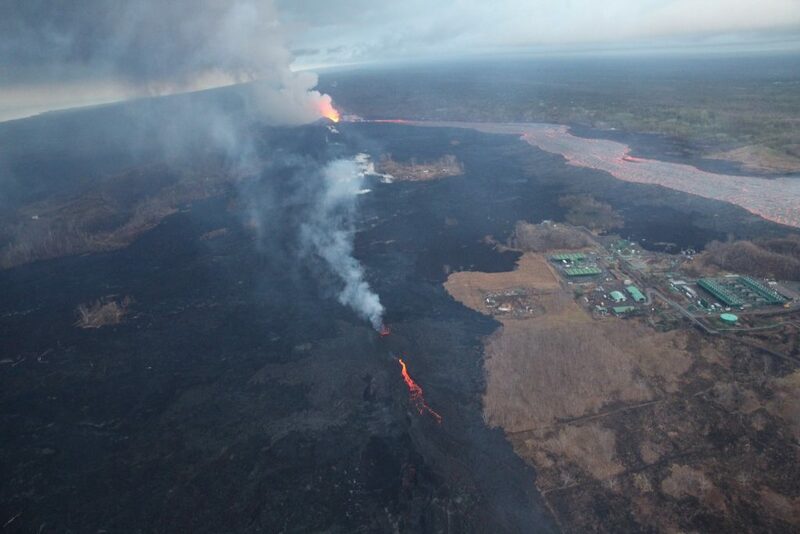 to the sea, is still squeezing out of the broad 6km (3.7) mile lava delta to the north of the new ocean entry. Today’s summit collapse occurred at 7:06pm HST, with the energy equivalent of a 5.3 earthquake, as usual. HVO is setting up a new livestream from Volcano House, but it’s not fully operational yet, so we made do with the ailing HVO webcam today (video clip). 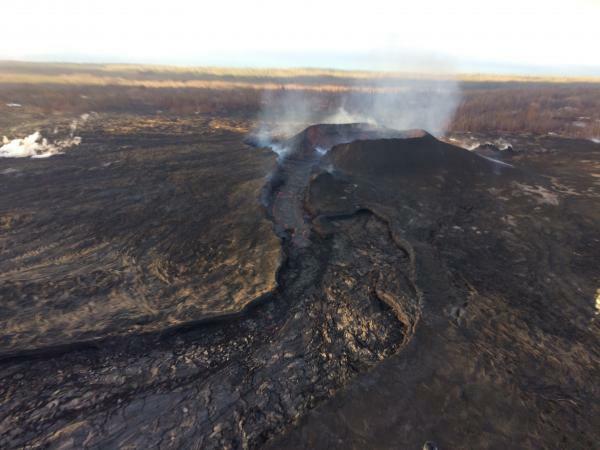 Kīlauea Message Fri, 13 Jul 2018 21:53:34 HST: Following the 19:08 HST summit collapse explosion today there was an increase in activity from fissure 8 resulting in channel overflows on the south side of the flow near the vent. The LERZ eruption continues with minor variations. 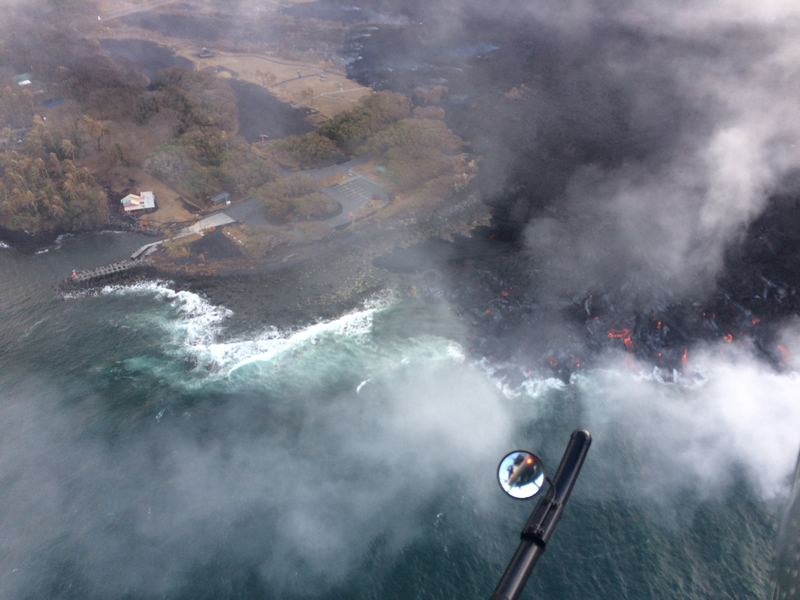 This morning’s USGS overflight crew observed that Fissure 8’s fountain and lava level in the upper channel appeared to be slightly lower. However, the lava flow rate down at Kapoho Beach Lots —where there were only a few houses left, as of this morning — seems to have picked up slightly. Meanwhile, overflows spilling out from the constricted turn around Kapoho Crater have nearly reached Beach Rd about 0.2 miles north of Four Corners. 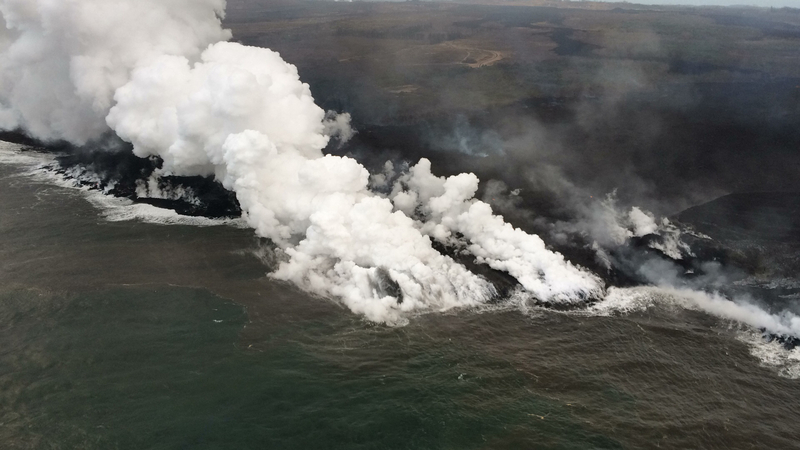 Lava continues to enter the ocean along a very broad front, mostly on the northern side of the delta. Fissure 22 is “sporadically spattering,” and its flow may have stalled. By the way, if anyone else was confused by recent Hawaii Tribune Herald articles that said SO2 levels had climbed tenfold at the summit, I checked with @USGSVolcanoes, who suggested a minor mixup. That increase is occurring down in the Lower East Rift Zone. At the summit, according to Kyle Anderson during today’s media conference call, SO2 levels have dropped to the level they were before the lava lake first appeared. Fissure 8 gushes on unchallenged and unchanged, while Fissure 22 — remember the chief subject of Lavacam?— has started spattering 50-80m and sending out a modest lava flow headed NE along the edge of previous flows. Down at the coast, lava continues to ooze out from under much of the northern part of the delta along a broad front, with “pasty” lava squeezing out in several places along Kapoho Beach Lots. As of 8:30pm 11pm HST, I’m waiting for confirmation of the next summit collapse/explosion. 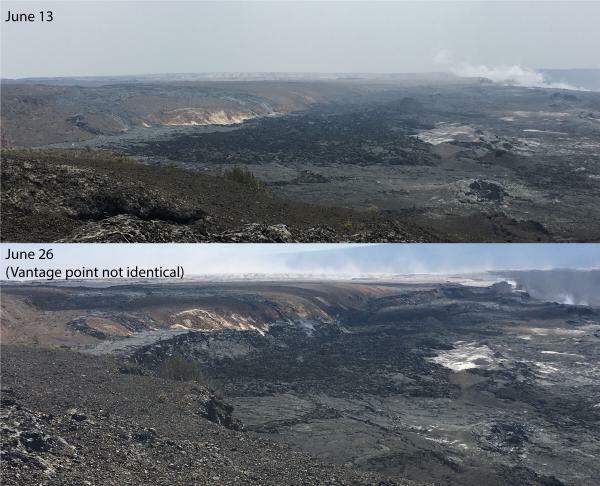 Besides Fissure 22 reactivating in earnest, the news today is that new digital elevation maps and satellite images give us a clear view of the subsidence of Kilauea Caldera around Halema’uma’u, which has begun to show in livestream and webcam views lately. 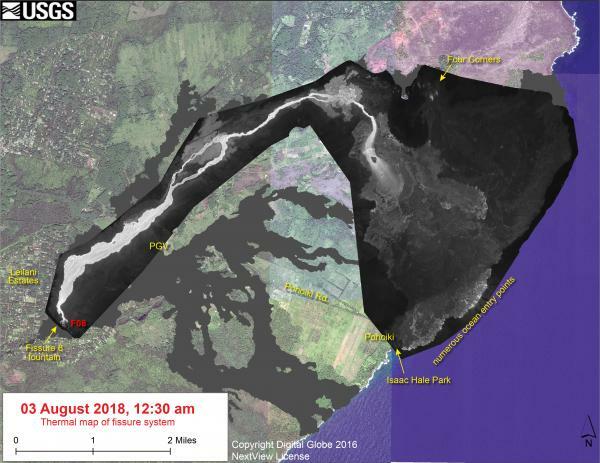 Last but not least, the USGS posted this map of the fracturing around Halema’uma’u. 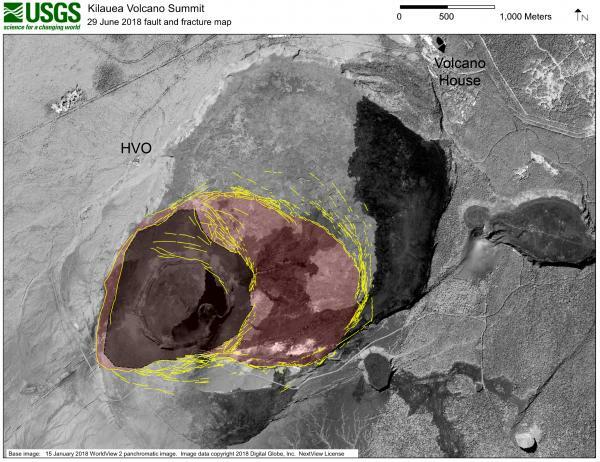 Note that the diagram is projected onto a satellite photo of the pre-May caldera, so there’s a ghostly image of the Halema’uma’u we remember in that dark gray area. So there you have it. Who would’ve thought the draining of the lava lake, which was minuscule compared to the whole summit caldera, would’ve had a domino effect this large? 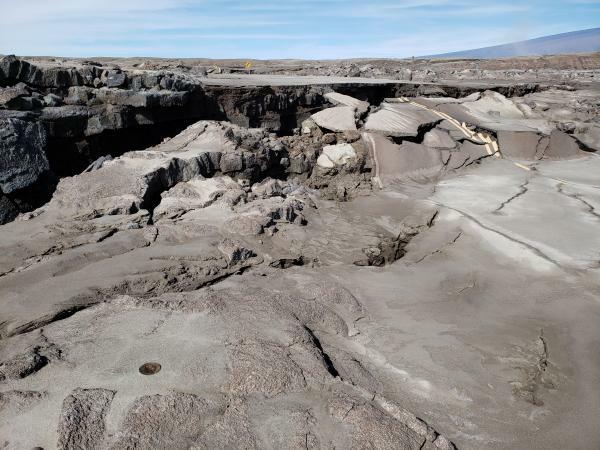 The rest of this post is a fairly sparse weekend roundup of a few news stories, videos and photos, plus of course the usual science geeking with USGS. Which leaves you time to browse the USGS Thursday evening talk I transcribed today! On Thursday, there was an hour and a half meeting with the USGS, National Park Service and residents of Volcano Village. Above is a video of the whole meeting. As usual, I’m interested in the geology, and so I’ve made a transcript of that part of the meeting. 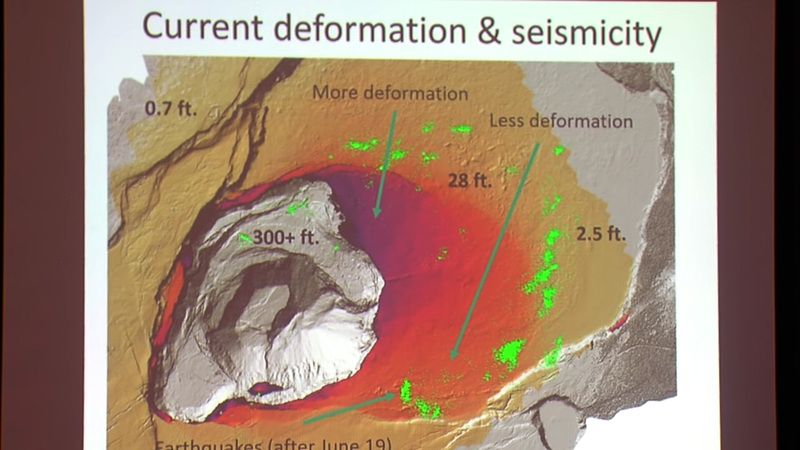 The first half of Kyle Anderson’s talk rehashes the “collapse/explosion” events that we’ve covered before, but the second half has a timelapse of Halema’uma’u from June 1st to June 28th — which I’ve rebuilt frame by frame, since I could just make out the timestamps— plus the latest Digital Elevation Model of Kilauea’s summit showing the slumping not only in Halema’uma’u, but across part of the caldera floor. [6:20] So tonight you’ll hear from familiar faces, Kyle Anderson and Don Swanson, who will give you an update on what the volcano is doing, what we think is happening, and we’ll touch on this very important question of how long and how big. Those are very hard questions to answer, so let me just preview that we’re not going to give you a wonderful take-away that will solve all that uncertainty. But we’ll do the best we can. Status quo continues, with Fissure 8 feeding a large, fast-flowing channel to the ocean, where it’s entering on the south side of the lava delta today. Upstream along the river, there’s occasional spillovers, but these never travel far from the levees. Top speeds on June 18 were measured at 20mph, by the way. Fissures 6 and 16 have reverted to fuming. (I see no white speck left of Fissure 8 on the LERZ webcam [correction: it’s back at 9:45pm]). Today’s summit explosion occurred at 4:22am (5.3ish), with a minor ash plume rising 6,000 feet above sea level (2000 feet above Kilauea). USGS: “The rock wall at the Jaggar Museum Overlook is cracked and crumbling. 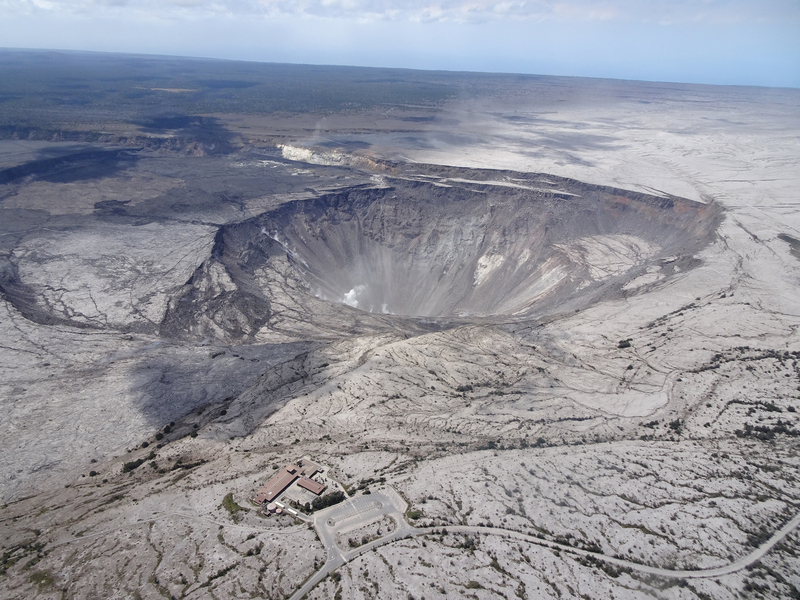 USGS/HVO photo of Fissure 8, spatter cone and rainbow, June 6. Last night, USGS scientist Steve Brantley explained the current eruption in an informative 10 minute talk. 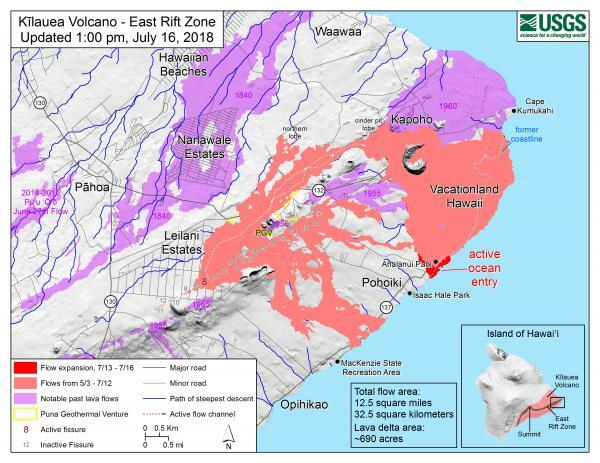 I transcribed it as a separate post, but here’s a rough summary: Magma heading down to the Lower East Rift Zone is causing the summit to deflate. Deflation is causing a pattern of more and more earthquakes over 30-50 hours until the summit releases the strain with an explosion, accompanied by an ash cloud. Sure enough, there was an M5.6 explosion and 10,000 foot ash cloud at 4:32pm. HVO’s Twitter account had a great impromptu Q&A session about it (see below). Meanwhile, down in the Lower East Rift Zone, Fissure 8 shows no signs of slowing. It’s wiped out Vacationland and nearly all of Kapoho Beach Lots, and is continuing to create new (crumbly, hazardous) beachfront real estate. USGS has also been posting some striking imagery today.